Having a well balanced diet doesn't only include different cuts of fatty meats and a wide array of veggies - it also includes Pepperoni Chips! Whether or not you're a snack-er, this is a quick and easy recipe to turn to in case you find yourself in a snacking mood or needing to satisfy someone in the family! It's great for hosting, movie nights, packing in lunch boxes and eating right off the baking sheet. Making our easy spinach artichoke dip for the perfect dipping side. Our Favorite No Carb Chips! The one thing about keto that makes it hardest for me is the lack of crunchy snacks. The thing I miss the most is tortilla chips, jalapeno kettle chips, BBQ chips - all the chips. 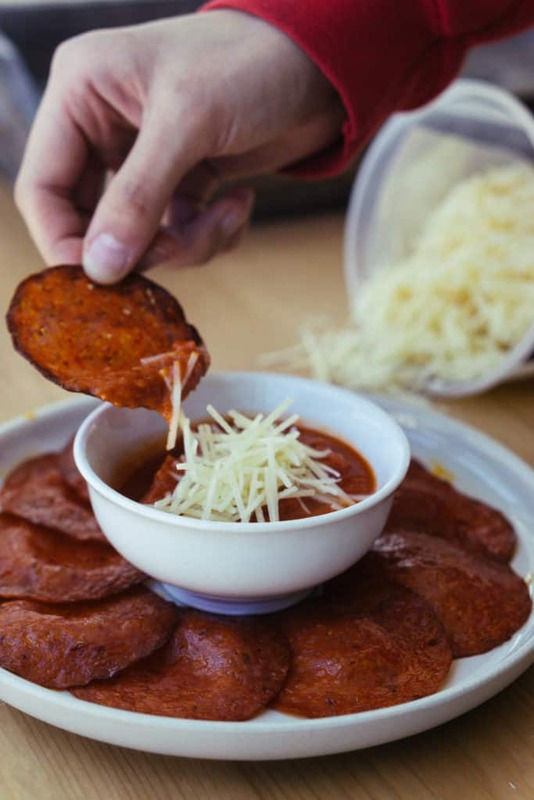 It's hard, even impossible, to replicate chips in any form, except for with pepperoni. These are even a great snack option for non-keto people. Just buy a pack of your favorite pepperoni or salami and after baking them for a couple minutes you end up with no carb chips! These pepperoni chips are definitely some of our favorite snacks for dipping or just eating on their own. But, the snack buck doesn't stop there - we've got plenty more quick and easy snacks in our arsenal, including our jalapeno parmesan crisps and curry deviled eggs! 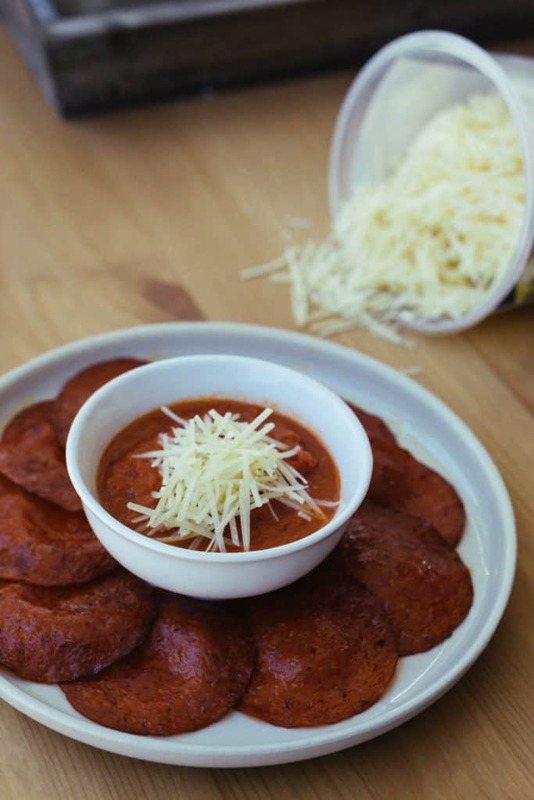 However, some of our favorite keto snacks take a little extra time, but are sure worth the wait, and they are our low carb beef jerky, easy pizza dip and fried goat cheese! Although we prefer big meals to snacking all day, sometimes snacks are in order and when you find yourself in that situation you can always turn to us for some keto-friendly options! For many people snacking is almost innate - it's a part of who they are and there is nothing wrong with that. It is just important to make sure the snacks you choose fit into your daily macros or don't make you feel bad. You also want something to satisfy your cravings and relatively easy to make! If you are anything like us and love savory snacks that take less than 5 minutes to make these pepperoni chips will fit perfectly into your snacking lifestyle! 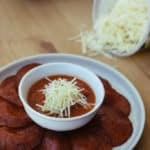 Recipe can be quickly added to MyFitnessPal - Search "KetoConnect - Pepperoni Chips"
Line a baking sheet with a silicone mat or parchment paper or leave it unlined (it will only be in the oven for 2 minutes). Layer the pepperoni slices in a single layer along the baking sheet. Bake for 1 1/2 to 2 minutes. Keep on eye on them as they brown along the edges. Transfer from baking sheet to a plate and allow to cool for 10 minutes. Pepperoni will harden. Serve and enjoy! Note: You can use any pepperoni or salami you want to make the chips, but the nutrition will vary.